How do you write about a feeling? It’s the feeling you get when a well-scripted plan meets a group of hard-working volunteers; when work meets play meets growth; when education meets restoration meets recreation in a symphony of dirty hands, elbow grease, and whitewater. 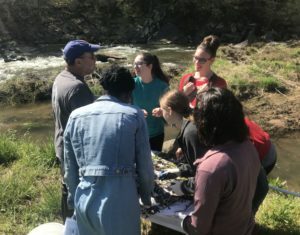 That feeling was manifest when Orange County High School joined Friends of the Rappahannock in Madison County for two Plant and Paddle field days in early May. 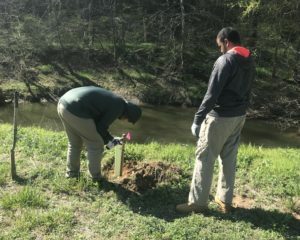 Each field day began with two hours of tree planting, with the goal of establishing a riparian forest buffer along the Robinson River, a tributary of the Rappahannock. Every half-hour, small groups of students took breaks from planting to don chest waders and join FOR Community Conservationist Woodie Walker in collecting and identifying benthic macroinvertebrates. “Macros,” as they are known shorthand, are aquatic insects that serve as biological indicators of water quality. “It’s important to collect baseline data so we can come back in a few years and find out if we’re moving in the right direction,” said Walker as he plucked a wiggling mayfly larva from the bug net. After the work was done, it was time to hit the river. 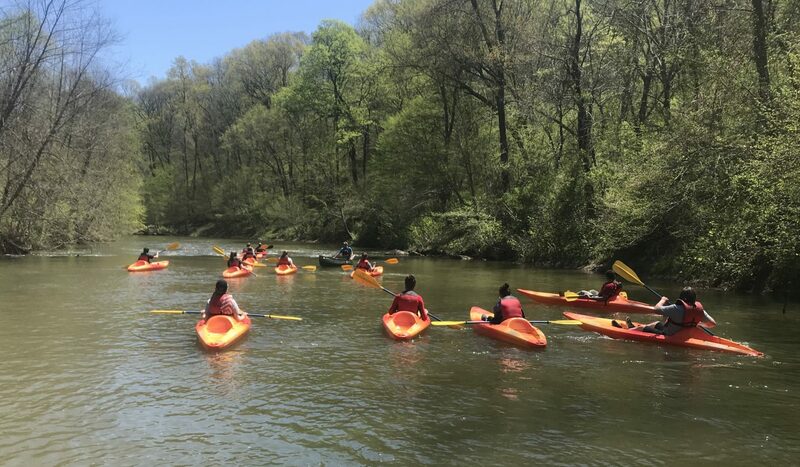 Amidst 80-degree breezes and bluebird skies, the students loaded into kayaks and headed down the Robinson for a thrilling 2 ¼ mile paddle, led by FOR safety volunteers and Rapidan River Kayak Company owner-operator Beth Seale. Once on the water, the students enjoyed the shade of the mature riparian buffer surrounding the river, previewing the future condition of the forest they had planted hours earlier. “Today really encapsulates FOR’s mission because it brings students together for a common purpose and helps them enjoy a resource that wouldn’t be available without clean water,” said Lynch. Due to natural constraints in planting and paddling seasons, the window for Plant and Paddle field days is only two to three weeks in length. That makes the experience all the more special for those involved. It takes a village to run a project like this. Planting materials and resources were furnished by generous grants from the National Fish & Wildlife Foundation’s Chesapeake Bay Stewardship Fund and the Chesapeake Bay Trust. Paddling equipment and staffing were donated by Virginia Outdoor Center and Rapidan River Kayak Company. Additional thanks to our programmatic sponsors including The Virginia Environmental Endowment, Patagonia, and the Virginia Department of Forestry. Special thanks to Anna Burkett, other adult chaperones and volunteers, and Orange County High School for all their hard work.